There’s no shortage of first-person shooters to blast through these days, but it’s rare to find a member of the genre that values narrative excellence over mechanical precision. 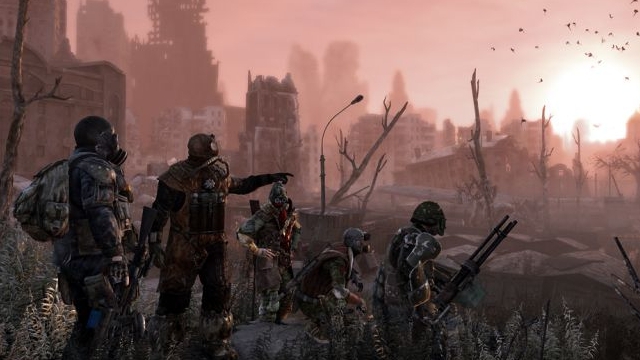 4A Games’ 2010 release of Metro 2033 was a rare case of a shooter with more brain than brawn, and the forthcoming Metro: Last Light seems to be continuing that trend by placing its desolate world and human drama at the forefront. The game’s new publisher, Deep Silver, brought a substantial demo for the press to see at this year’s show, and I’m happy to report that there’s plenty to love in this continuation of Artyom’s bleak journey. Things still look bleak in the Metro. This is a post-apocalyptic world where citizens travel through underground tunnels to reach the dilapidated enclaves they call home, but gas masks are available for those who wish to brave the great outdoors. Yet, things aren’t exactly “safe” outside the tunnels. Revolting monsters with a tendency to seek violence over careful conversation roam what’s left of the above-ground world – making the still-dangerous Metro the safest option. The unique story of the games is written by Dmitry Glukhovsky, the author of the Metro books that have found great success in markets all across the world. However, America has yet to accept his works of fiction with open arms. Glukhovsky, who was present at this year’s PAX East, isn’t too concerned with his creation’s lack of penetration in the States. He’s trusted 4A Games and Deep Silver to represent his beloved work in a manner suitable for a wide audience, and their labor and dedication to the fiction has impressed him. However, it’s difficult to get a firm grasp on the story through a 30-minute press demo. Instead, I was forced to barrel through a gambit of action sequences, which feel much tighter than what 2033 had to offer. Yet, this sequel still doesn’t feel like a fast-paced, breakneck shooter throwing room after room of grunts in your line of sight – even though that would be the easiest development route. Instead, Last Light nudges players in the direction of stealth when entering a highly monitored room. Both lethal and non-lethal tactics can be executed, with most of the actions initiated through a simple click of the right stick. For the most part, the takedowns feel satisfying. But if things go bad and that dead body you forgot to hide in the corner gets spotted, it’s not the end of the world. It’s the snappiness of the armaments and swift melee actions that allow for more manageable combat scenarios when the opposition is notified of Artyom’s presence. Guns have a substantial pop when fired, and the AI’s use of cover forces the player to constantly consider character positioning relative to the environmental elements and the placement of shots. Supplies aren’t scarce to a frustrating degree, but if you’re like me and attract attention much sooner than necessary, wasting ammo on misplaced shots can come back to bite you. There’s no multiplayer to speak of in Last Light, but Brand and PR Manager Jeremy Greiner believes this has helped to create a richer, more substantial single-player experience. No cooperative mode will be included, either. So, all eyes are on the campaign to make people feel like they’re getting their money’s worth. Metro: Last Light may have unexpectedly switched publishers after the closure of THQ, but everything I saw at PAX East has me more excited than ever to head back to the Metro. Look for it on PlayStation 3, Xbox 360 and PC May 14.